I don't know why but whenever I see Chevron stripes, it makes me smile. I guess it effects a lot of people that way and that's why Chevron is such a popular theme for a baby shower. The Chevron, an inverted "V" shape, has been used in art and design since way back in 1800 BC but lately it's become a trendy style when used on invitation designs. Today, I'm featuring these cute zig zag stripes on invites that were created especially for a baby boy. The following are a few of my favorites just because of their fun factor but there's plenty more to choose from. 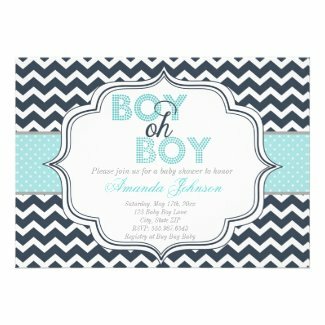 Click on your favorites here to learn more or visit Chevron Boy Baby Shower Invitations to see them all. This super cute sailboat and Chevron stripe invite is perfect for a summer or nautical shower. Red, white and blue with a touch of gray for variety, these are sure to please all of your intended guests. Personalize them with the parent's names and all of your important party info. See more cute Chevron and Sailboat designs. Bright lime and aqua stripes make this an adorable invitation for a boy's baby shower being held in the summertime. The design features Chevron stripes at the top and the same pattern on a sweet little baby carriage with a lime green border at the bottom. There's plenty of room for your personalized information in the middle. Boy, oh boy is this one cute or what? 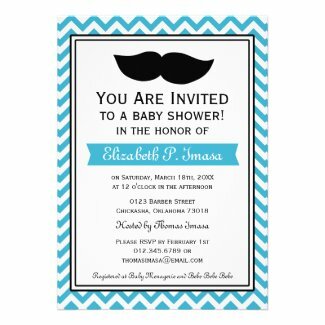 Not only is this design one of my personal favorites, it also happens to be one of THE most popular boy baby shower invitations at Zazzle.com today. The gray and white Chevron background is sliced horizontally across the middle with a cute blue and white polka dot faux ribbon and a white badge in the center filled with your personalized info. Best of all, this one can be used year round. This baby shower invite will surely be a big hit with the baseball fans. Design features navy and baby blue stripes across the top and a bold baseball that says "It's a Boy" with a blue background where you'll personalize it with all of the party information. Perfect for a springtime shower! See more sports Chevron Boy baby shower invites. I mustache you you a question. Isn't this invite adorable for the little man's shower? With a bold black 'stache and plenty of aqua and white stripes, the fun never ends. Personalize it with all of your party information and go. You'll find this one in several other colors too. See all of the mustache chevron baby shower designs. Each of these high quality invitations are a big 5" x 7" and come with a white envelope and a 100% satisfaction guarantee. Pricing will be determined by your choice of card stock and the quantity of invites that you order. Order only as many as you need. You'll find discounted prices on bulk orders of just 25 or more.